Sampdoria fans are mad after Montella left their club for Milan. You see, they had paid to get him out of his contract at Fiorentina. That and he was a much better coach than his predecessor, Walter Zenga, who really needs to just stop and let people remember him as a goalkeeper. Seriously. And they forget that we also paid them to get Montella out of his contract. But despite Giampaolo getting them off to a decent start this season, it is reported that the Sampdoria fans will protest Montella. Because I guess that’s just what they do. It’s not enough that we’re facing a team with a better record at their home stadium. And not just any stadium, but at the Marassi. All on a Friday night. But then I suppose that stadium alone could drive anyone mad. Whether it was the Marassi or he was just born that way, Massimo Ferrero is mad in a very different way. He offered to shear his infamous locks if Sampdoria beat Roma last week. And it took heavenly intervention to keep his hair, too. Sampdoria were up and were doing well when the heavens opened a deluge of rain and hail that sent everyone under cover for over an hour, I think, cooling Sampdoria, but letting Roma remember they had a much better team, and Sampdoria ended up losing that one 3-2. It didn’t change Ferrero’s mental health in any way, but it did allow him to keep his hair. Oh, and don’t ask him about Cassano. He blocked Fantantonio from speaking to the media, but is more than happy to go on for days about the shut out but not leaving Nutella-lover himself. For their match last week vs. Roma, Giampaolo lined up: Viviano; Regini, Silvestre, Pavlovic, Sala, Quagliarella, Torreira, Alvarez, Linetty, Barreto, and Muriel. He will be missing Tozzo and Carbonero to fitness issues. Due to their strong start of winning two of their first three matches, Sampdoria have turned the table upside down for now, sitting in fifth place, while Milan sit in 15th. I have no idea how or why, with the players the respective teams have, anyone could be mad about missing Montella right now, but they are. Speaking of Montella, after all of the players bragging about how lovely trainings were and how Montella yelled a lot less than Mihajlovic, Montella got very mad at his players after the Udinese loss. In a “confrontation” at Milanello, he explained that everyone would have to fight for their starting spot, no matter what their name was or whatever. Which is the way it should have been all along. While fans are clamoring for Calabria to start ahead of Abate and Sosa to send Montolivo to the bench, keep in mind that the sale of the club is not yet final. So if Montella wants to keep his job, he may not follow through on his threat. Additionally, Kucka is suspended for this match, and Montella will still be missing Bertolacci, Zapata, and now Mati Fernandez to injury. Antonelli is very unlikely to play as well. So even if the fans have been mad at Montolivo for most of his career at Milan, Montella may still pull the injuries card as justification for putting the paper captain out there. Milan fans are also still mad about the loss to Udinese at home, but honestly, I wasn’t even surprised. I mean literally what has changed at the club to warrant the expectation of a win? In the last 2.5 years, we’ve had six different coaches. Galliani went thrift store shopping in the mercato, kind of like repairing body damage on your car with scotch tape. And speaking of players in and out of the club, over 70 of them in the past four years. How is a team like that supposed to guarantee a win against anyone? I can’t be mad at the players. With everyone so mad, it seems to be driving people to absolute madness. Well Ferrero was already there, but I meant everyone else. 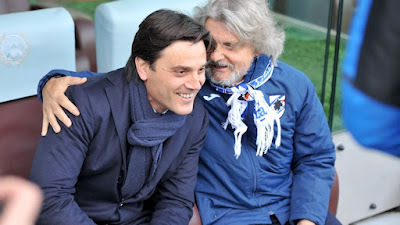 The match should be a must-win for Montella, but given the stats and the cursed stadium, that’s a foolish notion. Sampdoria will want the win badly against the coach who left them like a woman, according to crazy Ferrero. But on a Friday night at the Marassi, anything is possible. Well, Juve won’t win a Champions League match, but anything else is possible. So why be mad?